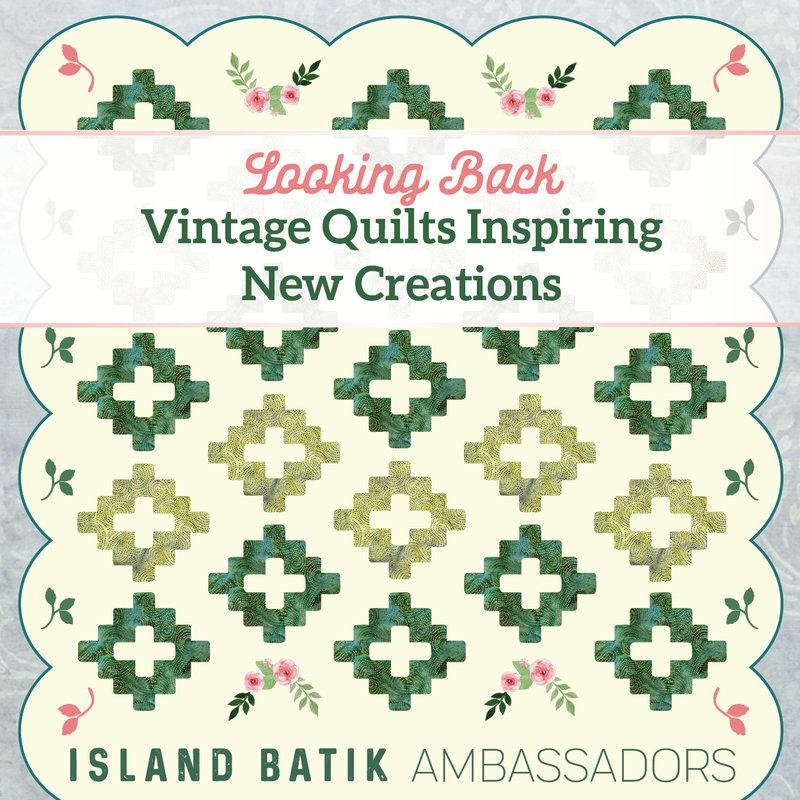 This month's Island Batik Ambassador challenge was to be inspired by a vintage quilt. I admit, I struggled to find inspiration! A few weeks ago when I was hunting for just the right inspiration, my mom purchased a box of quilt paraphernalia at a flea market in Kansas. It turned out, this box was a quilter's personal collection of patterns and homemade templates from the 1930s! She sent me a stack of the patterns in hopes it would be just the ticket - and it was! 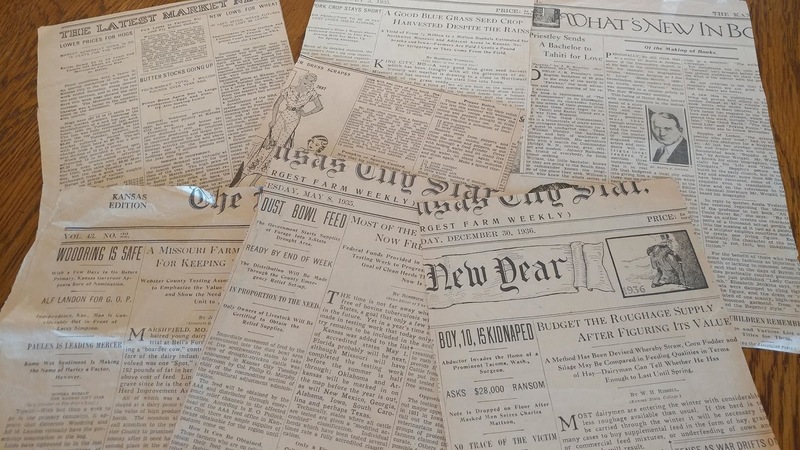 The patterns my mom sent me were actual newspaper clippings from the Kansas City Star newspaper from 1932-1937. The quilter had carefully cut the patterns from the newspaper, and I am shocked at the remarkable condition they are still in! The back of the quilt patterns are just as exciting to read! On the back of the Double Nine Patch pattern that is dated 1932, an article states there is less than a week in the primary campaign, and Governor Woodring and Alf M. Landon will likely get the Democratic and Republican nominations for state governor. On the back side of a Square and Half Square block pattern dated 1933 are recipes for Pumpkin Custard and Pepper Relish. On the back of a Railroad Crossing block pattern dated 1935, there's a graph showing that one person in every seven in the US is receiving emergency relief funds from the federal government. 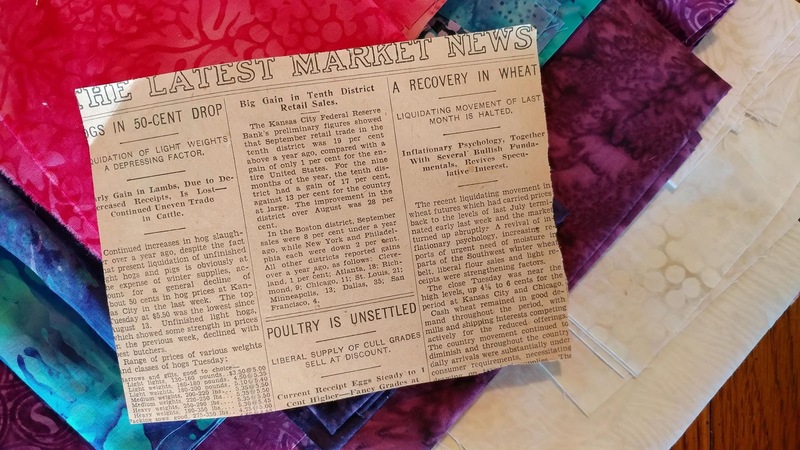 Another pattern dated 1935, The Churn Dash Quilt, has an article on the reverse about how livestock owners in the 5-state drought area affected by the dust bowl can receive emergency relief feed for their cattle. The Four Pointed Star pattern dated 1937 has a rather humorous (to me) article titled "The Groundhog is Wrong." The paragraph reads: "Exploding the groundhogs' reputation as a weather forecaster, Mrs. Blanche Grieve of Portis, Kas., reported she had kept detailed records for the last twenty-five years on his prognostications. The groundhog saw his shadow sixteen years of the twenty-five and in almost every instance was completely wrong about the weather for the next six weeks." I sorted the newspaper patterns by what I considered "time consuming" and "doable." Then I got out my stash of Island Batik fabrics to see what was "modern." Since this is my second year as an ambassador, I do have a bit of a stash of fabric that Island Batik has sent me! I had scraps of multiple whites, purples, pinks, and teals that I thought coordinated nicely. Most are from their basics, blenders, and neutrals. 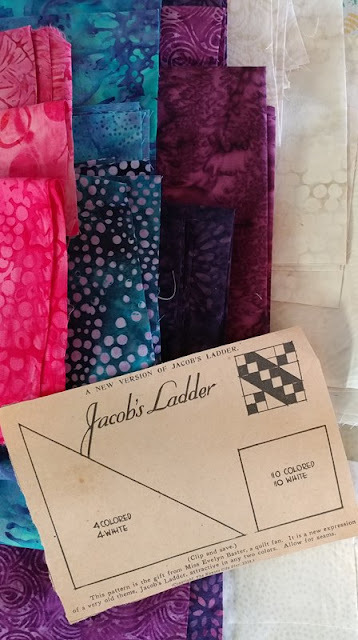 Once I chose the fabrics, I was able to quickly pick the "Jacob's Ladder" pattern as being a good fit. The pattern has the text: "This pattern is the gift from Miss Evelyn Baster, a quilt fan. It is a new expression of a very old theme, Jacob's Ladder, attractive in any two colors." The pattern states Copyright, The Kansas City Star, 1934. The back of the pattern has prices of hogs, poultry, and wheat. I used my Electric Quilt software to create the Jacob's Ladder block and play around with settings and fabric placement. After playing a bit, I found a design that I really loved! 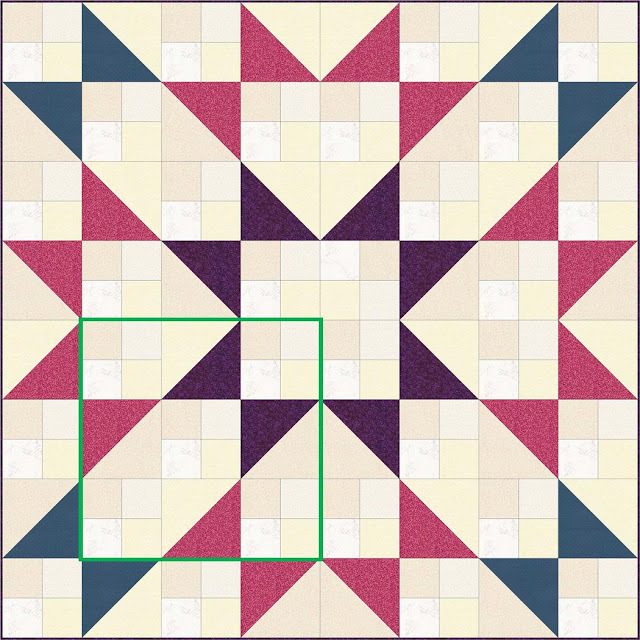 Here, I've outlined the original block so you can see how I recolored and rearranged some of the pieces to create the quilt design. After chain piecing the four patches, I laid out the blocks on my temporary design wall (just a cheap vinyl table cloth). I love this shot of the morning sun highlighting what it looks like behind the seams! 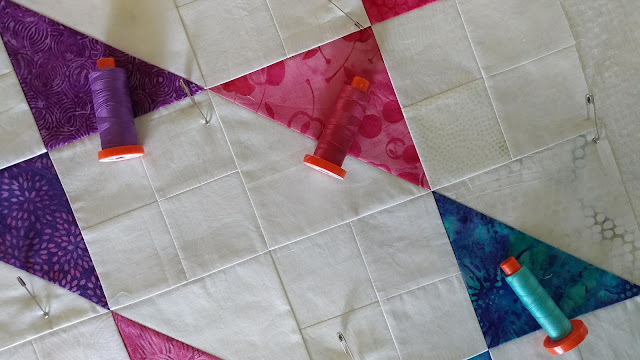 I pin basted the quilt on our dining room table and auditioned thread colors for quilting. 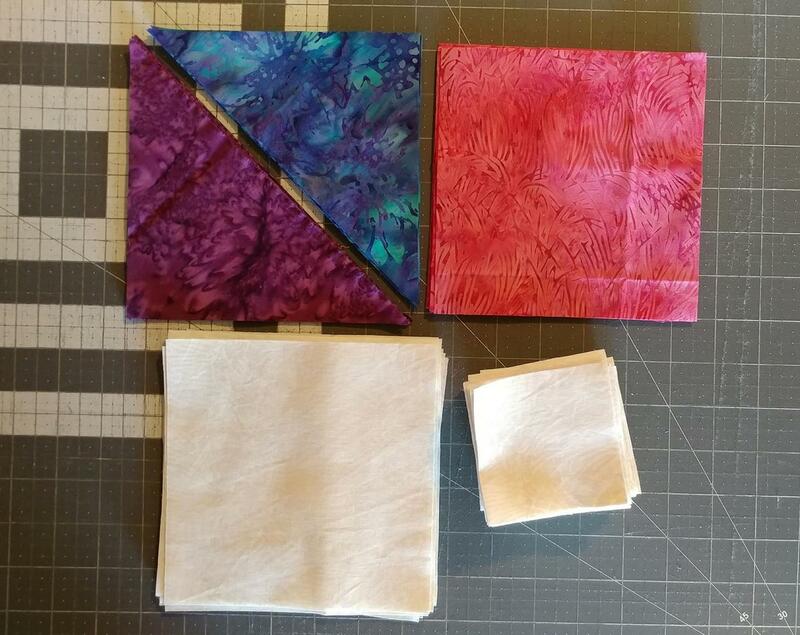 (Shown here are Aurifil 50wt threads in Medium Lavender #2540, #2455 Medium Carmine Red, and Light Jade #1148.) The batting is Warm & Natural by The Warm Company. Then I completely changed my mind and went with Aurifil 50wt thread in Shining Green #5017 for a bit more color and contrast. 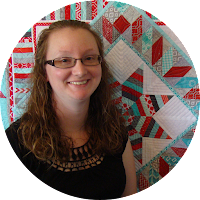 You know I like to try new things, so I decided it was time to try spiral quilting! I printed a spiral from my computer with spacing between the lines equal to the guide on my walking foot - about 3/4". 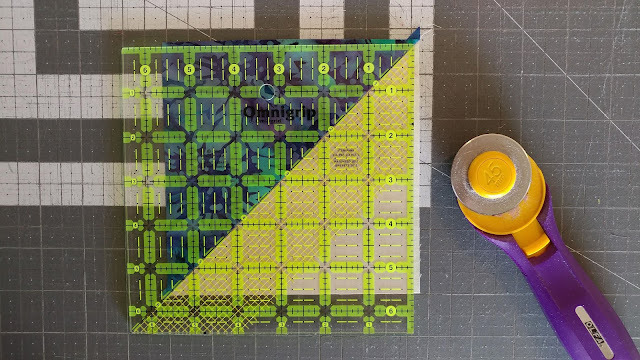 Then I used my Hera marker to trace the lines onto the quilt sandwich. I used the walking foot on my Juki TL-2010Q domestic machine to quilt the spiral. 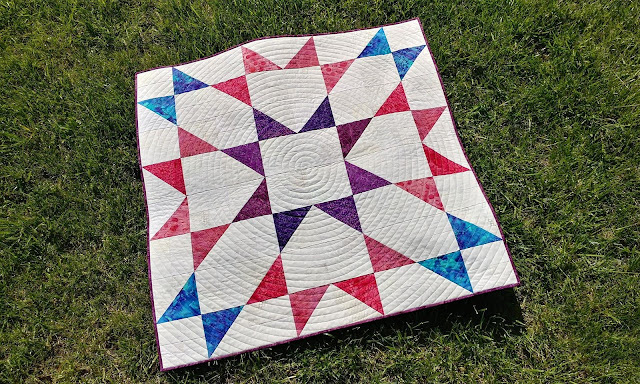 I dizzy quite easily, and this type of quilting did affect me a small bit! The center was quite challenging to get the lines to appear straight and not wavy. Next time, I think I'll cut my printed spiral on the lines, then use a disappearing ink pen to draw along the cut edge to get a more precise line to follow. Once the spiral got bigger, it was much easier to quilt and the wavy-ness of the lines was much less noticeable. Once quilted, I used 2 1/4" binding and stitched it on by machine. The back is an Island Batik basics fabric called "Peony." It's not a perfect match to the front, but it was the most colorful Island Batik fabric that I had more than a yard of! I love the finished quilt! It's 40" square - a great baby quilt size! I also love the spiral quilting! It went super fast and is definitely something I'll do again. The vintage pattern gave a diagram and had two templates for cutting. I made it modern by using a computer to test fabric placement, using bright fabrics, rotary cutting, the two-at-a-time HST method, chain piecing, machine piecing, machine quilting, and machine-stitched binding. I do appreciate all things vintage, but I'm very thankful for the advances of modern quilting! 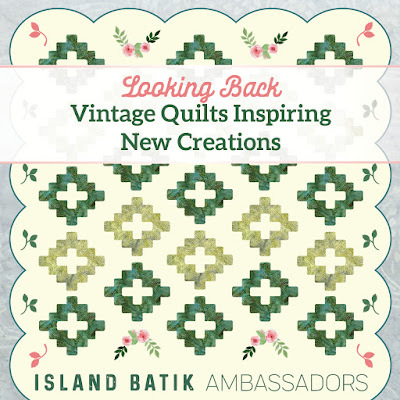 Be sure to watch the Island Batik Facebook page for more ambassador projects inspired by vintage quilts! Linking up with Linky Tuesday at Freemotion by the River, Let's Bee Social at Sew Fresh Quilts, Wednesday Wait Loss at The Inquiring Quilter, Midweek Makers at Quilt Fabrication, and Needle & Thread Thursday at My Quilt Infatuation. 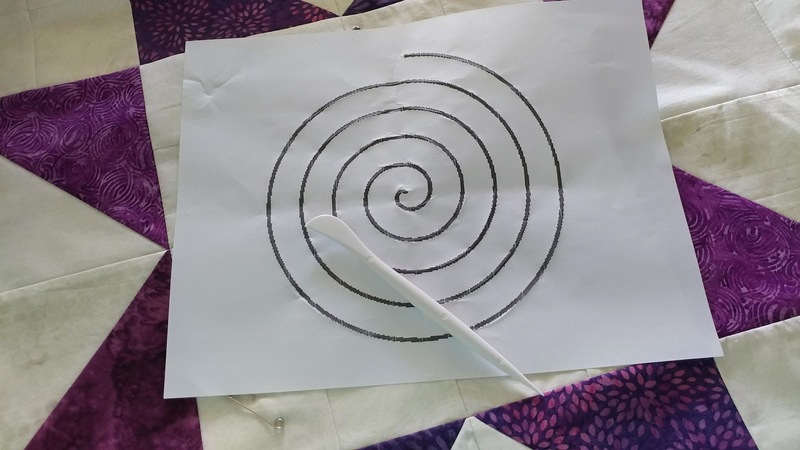 Thanks for the explanation of how to do the spiral quilting. I've been wanting to do it, but just wasn't sure how to get started. Looks great! I would never have said that was a Jacob's Ladder design until I saw your computer layout. Very clever, and I love the look. 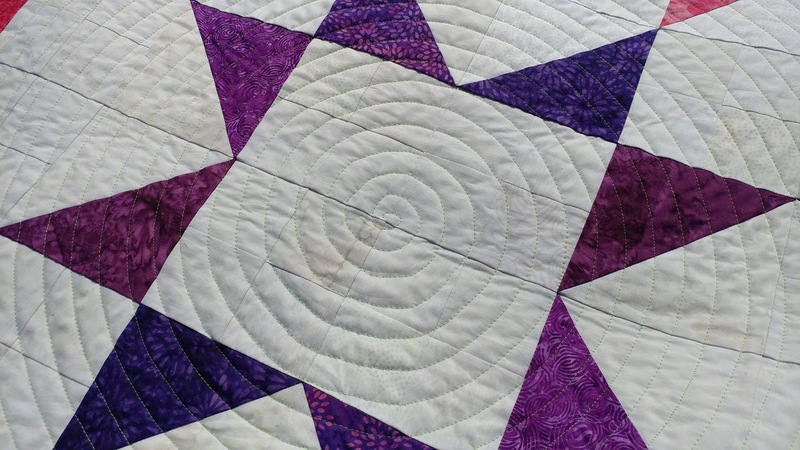 The spiral quilting is a great finishing touch! Love your modern take on Jacob's Ladder, Laura! Great spiral quilting, too! A beautifully finished quilt. I love the information about the old patterns, both front and back. I, too, appreciate all the modern tools (sans computer program) that make quilting today so much faster and, for me, fun. 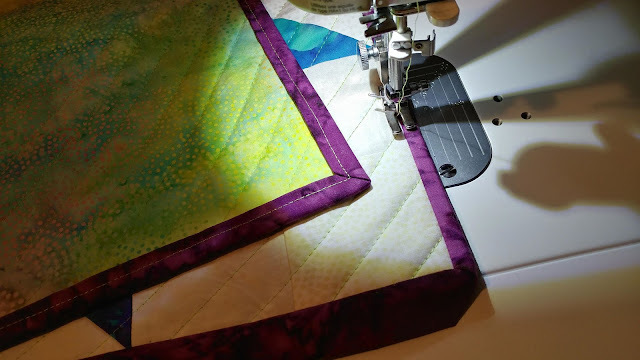 Have you tried doing the spiral quilting with a free-motion foot? Sometimes, I leave the feed dogs up when I use my free-motion quilt foot...I get a little bit better control. And I adjust the speed down a bit. It's always fun to see what you'll come up with to meet your challenge. Great job. I am so glad you included a pic of the box around the block as I could not make it out otherwise. Love what you have done here! Your quilt is beautiful! 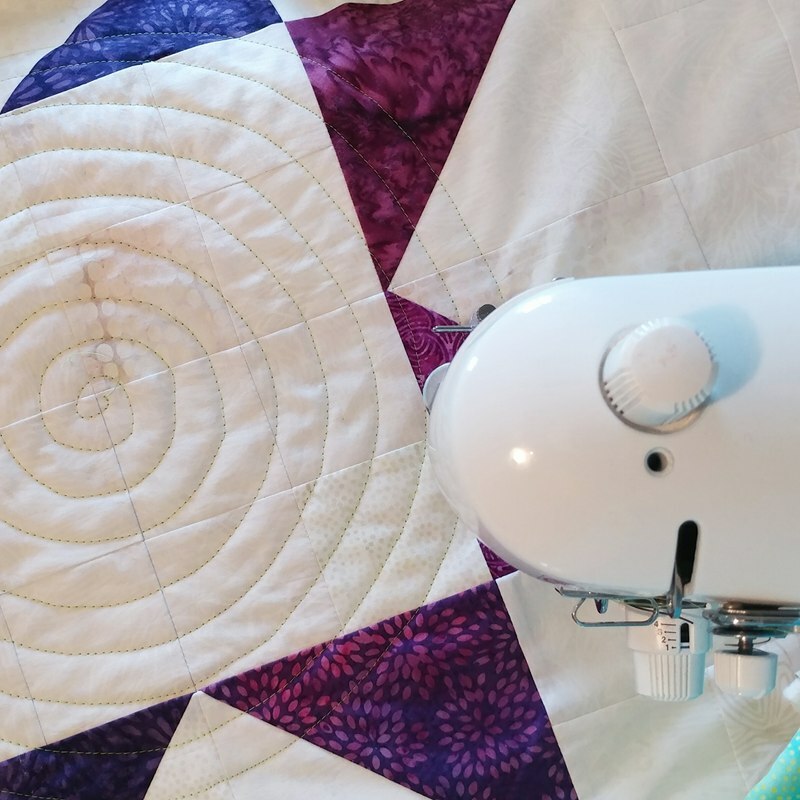 I'm glad I'm not the only one who doesn't have perfect spiral quilting. I say it just adds character to the quilt. I love this post! Your Mom found a treasure trove of goodness. I love that the patterns have snippets of history printed on the backs, and the way you reinvented an older pattern and made it fresh and modern. 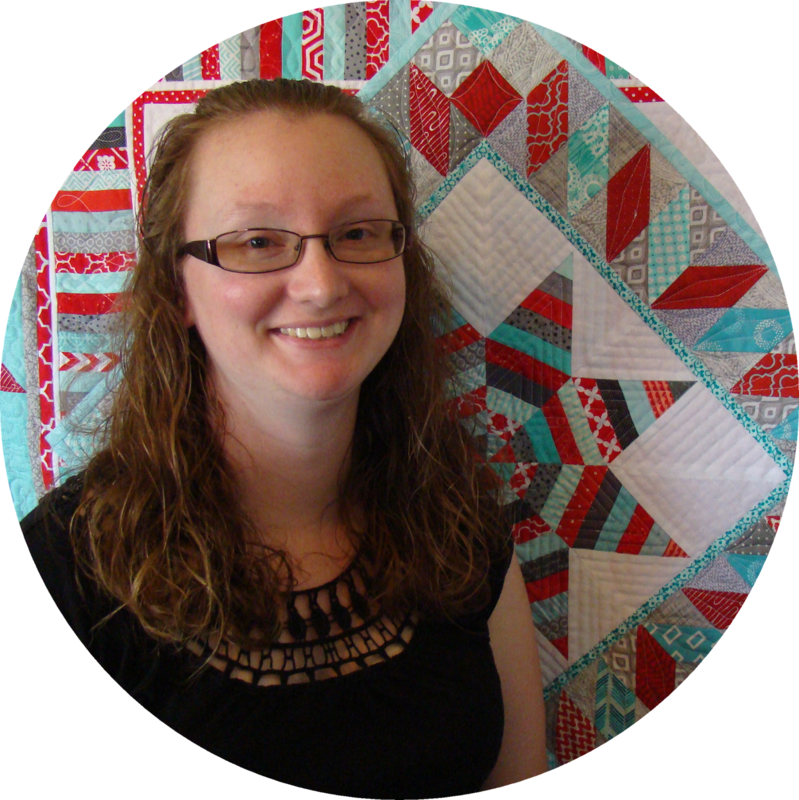 Your quilt is fantastic, and the spiral quilting looks wonderful! 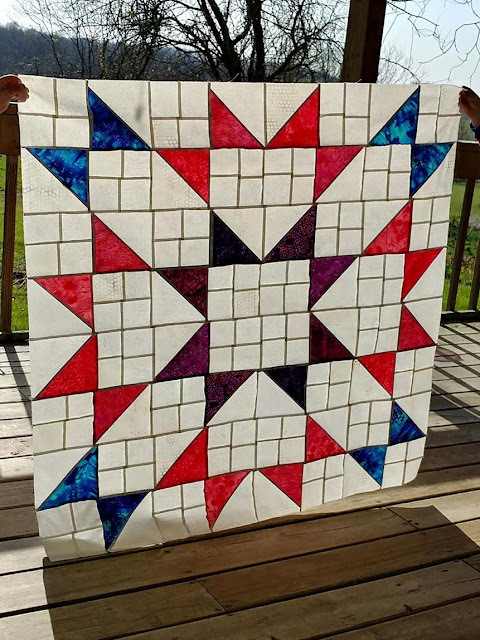 This is so cool and I love the quilting! 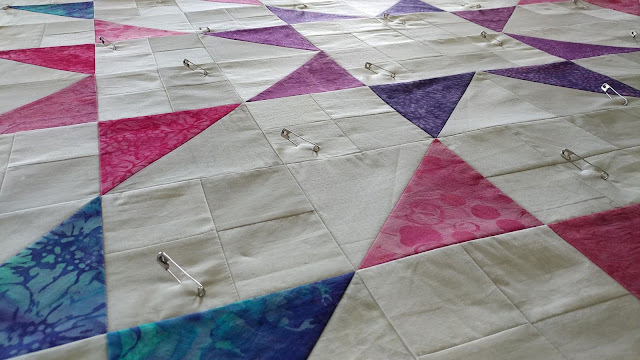 Getting started on spiral quilting is definitely the trickiest part; I really like your idea to print a template and bet that next time you'll refine the method. What an awesome grouping of patterns and history. I would be tempted to laminate them to help them hold up for many more years! Your quilt looks wonderful. Gosh, what a treasure those old newspaper patterns are. Awesome job coming up with all these modern techniques from a vintage newspaper pattern! Love the spiral quilting, too. I am going to try that down the road. What a beauty! Love the way you put a new spin (sorry about that) on an older design. And thanks for sharing some of the newspaper items--such fun! Very cool quilt! 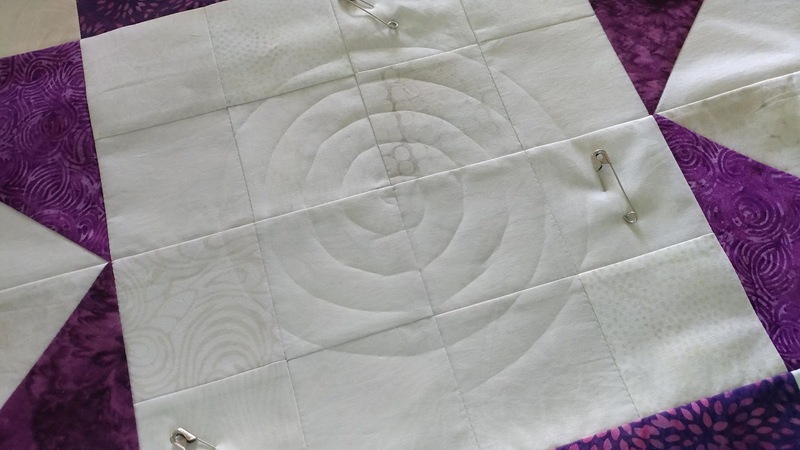 I love the spiral quilting, and your using a template to get started was brilliant! A beautiful quilt! 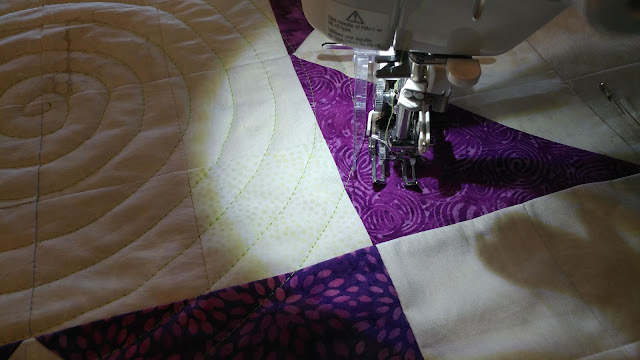 Spiral quilting is so much fun, I did that on mine, too. Wonderful job! I was thinking about circles for mine, but you did it. I love the way it works as yours has much more open space than mine did. I think if you washed and blocked the wonkiness would go away - we are always much too critical of our little digressions from the line. What a treasure trove! I love the groundhog story especially! 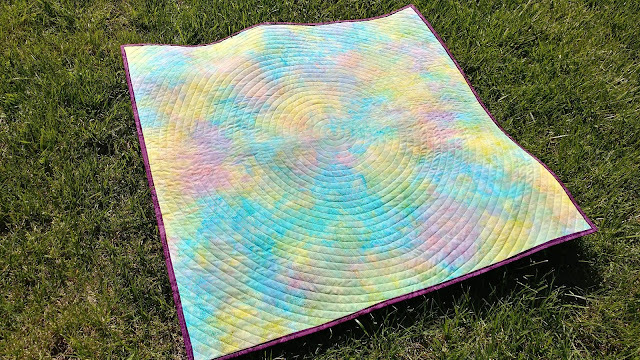 Your quilt is gorgeous and the spiral quilting is perfect for it. Oh Leanne took the words right out of my mouth . . . I was going to say what a treasure trove of patterns from a flea market!! How I wish I could find a cache of quilt stuff like that. 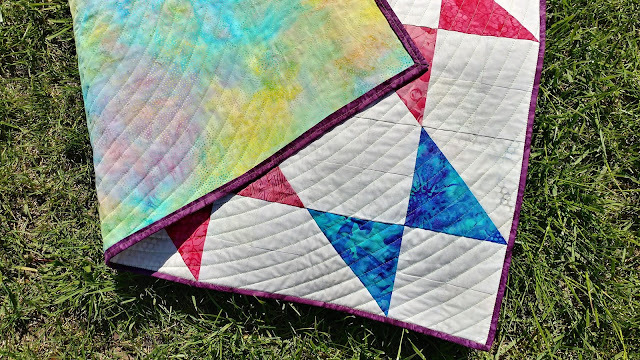 Love your pattern, and the spiral quilting. I tried that once and should have taken breaks during the quilting. I kept at it though, and my spiral started to become slightly out of round. But I still like the piece I made. Such a great find! And thanks for telling us what was on the back, it was almost as interesting as the quilt patterns! I love spiral quilting and yours looks great! That stack of old clippings is such a treasure. I'd love to read through them all! That's so my thing. I too would not have said this was Jacob's Ladder because your clever color placement transforms it! This is truly a modern quilt inspired by vintage. Bravo. I too am struggling with how to design around the amounts of fabric I have in particular colors. It's amazing (and quite wonderful) when I figure out how to make a pattern work my way, with what I have on hand. That extra challenge really pushes me to design, and it did you too! Beautiful quilt. Thanks for sharing it on Wednesday Wait Loss. 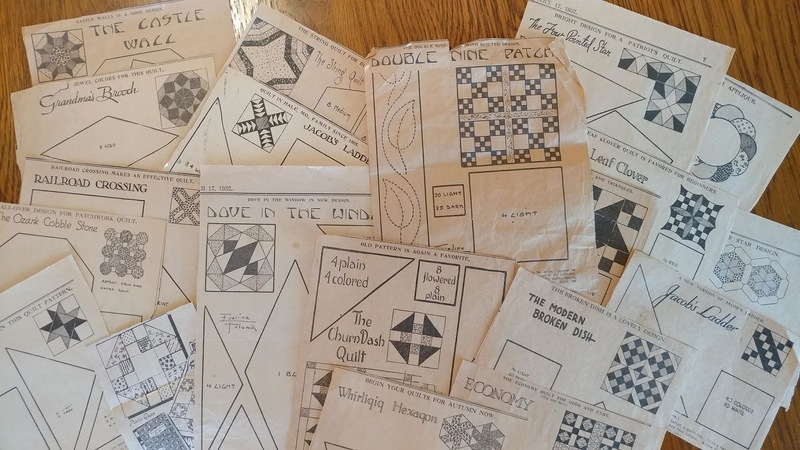 What a treasure trove of vintage patterns you received along with 80 year old history. love that you share your process when creating. You are an inspiration and make batiks modern looking. I love batiks. Lovely! 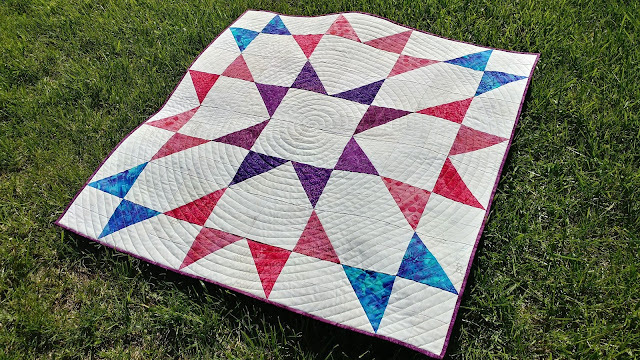 I've often been inspired by circle quilting but have not tried it. 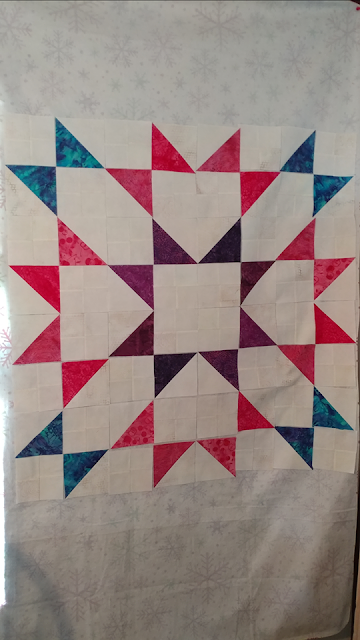 Nice star and your circle quilting looks great! Nicely done Laura, those patterns are a treasure!